« Enter This Week’s Tea Set Giveaway Contest! 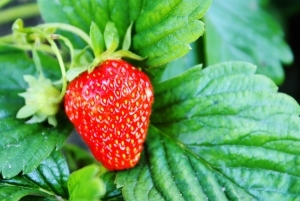 First bred in Brittany, France in approximately 1740, strawberries are one of the world’s most popular fruits, and are especially popular in the United States. Used around the world in preserves, juices and pies, the United States is first in strawberry growth, growing 1.1 million tons of the fruit in 2008 (Mexico was a distant second with 207,485 tons). According to a recent study in the American Journal of Clinical Nutrition, strawberries are third only to blueberries and walnuts in terms of antioxidant capacity. Strawberries are also a very healthy way to indulge a sweet tooth, as one cup (144 grams) of strawberries contains only 45 calories (on average) and is high in Vitamin C and flavonoids (which give strawberries some of their antioxidant properties). Thanks to the California Strawberry Commission for this wonderful recipe for their “Fresh Strawberry Buttermilk Shortcake,” you can visit their website for more information about this wonderful fruit! In a large mixing bowl combine the flour, sugar, baking powder, baking soda and salt. Cut in butter until the mixture resembles coarse meal. In a small mixing bowl blend buttermilk, lemon peel, one whole egg and one egg yolk. Stir into the flour mixture to make a soft dough. Divide dough into six equal portions. On a floured board, pat each portion of dough into a three-inch circle, and place on greased baking sheet. Brush generously with the remaining egg white, beaten. Sprinkle generously with additional sugar. Bake in 450° Fahrenheit oven for 10-12 minutes (until golden). Remove from pan and cool on rack. Sweeten strawberries, to taste (*author’s note: you may want to macerate your strawberries, depending on your preferences). Slice each shortcake in half horizontally with a sharp knife. Fill and garnish with strawberries and whipped cream. This recipe yields six servings. This entry was posted on Wednesday, April 6th, 2011 at 8:47 am and is filed under Mason Cash, Recipes. You can follow any responses to this entry through the RSS 2.0 feed. Both comments and pings are currently closed.